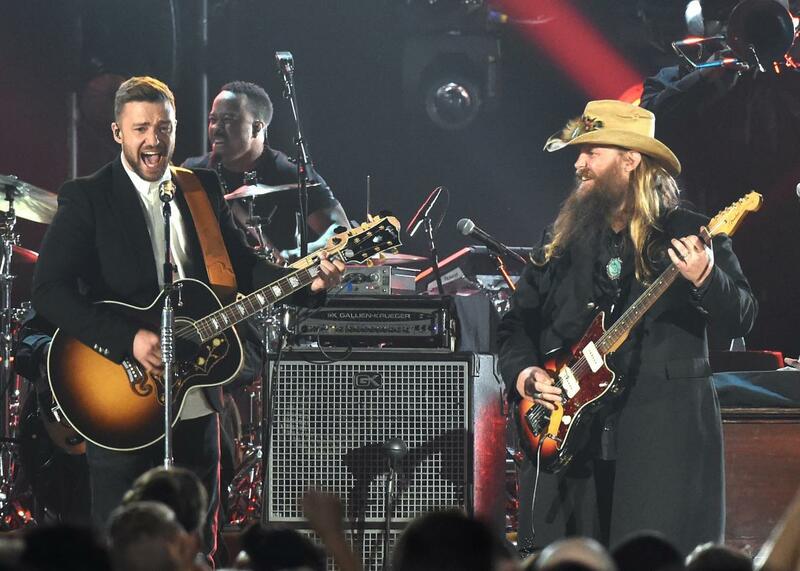 Justin Timberlake and Chris Stapleton’s CMAs duet showed the bros how it’s done (VIDEO). Justin Timberlake and Chris Stapleton brought the house down. Country fans found a lot to be hopeful about during last night’s Country Music Association Awards. After more than a few years of suffering through the reign of “bro country,” viewers were surprised to see the night reward many of the genre’s most exciting and most progressive new talents. Both Song of the Year and Single of the Year went to Little Big Town’s homophobe-tweaking homosocial ballad “Girl Crush,” for example, while Maddie & Tae won Music Video of the Year for their instant classic satire of bro country, “Girl in a Country Song.” Rumors that the awards signaled the death of bro country may have been exaggerated: The king of bro country, Luke Bryan, took home the night’s biggest award. But it still felt like the Country Music Association was leaving behind a style that seems to be finally making its last keg stand. And there was no artist whose success signaled that more than Chris Stapleton, the longtime Music Row songwriter who turned into a star performer this year with the release of his terrific debut album Traveller. Though Bryan took Entertainer of the Year, Stapleton was the night’s biggest overall winner, stunning everyone by prevailing against such alpha bros as Bryan and Jason Aldean to rack up Album of the Year, New Artist of the Year, and Male Vocalist of the Year. With an assist from Justin Timberlake, Stapleton also stole the night with what was quickly regarded as the evening’s best performance. Whoever thought to pair the two singers together, for these two songs, deserves their own award. Stapleton is a Nashville singer who’s known for blending soul phrasing with country twang, and Timberlake is, of course, a Memphis-born singer of soul and R&B (as well as pop) who has flirted with country on songs like the whiskey ballad “Drink You Away.” Performing that song along with the similarly-themed sour-mash mainstay “Tennessee Whiskey” (which Stapleton covers on Traveller), the two sounded like long-lost musical cousins, Timberlake’s sweet falsetto perfectly complimenting Stapleton’s barrel-aged growl. Regardless of whether the night sounded the death knell for bro country, it was a great reminder of the astounding level of talent in Nashville, even if it doesn’t always get amplified by the airwaves.